This flask is low cost as the engraving is limited to three characters, so if you're just looking to add initials to a flask, this is the choice for you. The engraving is also ideal for Fraternity or Sorority gifts as Greek letters are available for this engraving! This handsome satin finish 6oz stainless steel liquor flask comes with a funnel which will make an excellent gift for a good friend or a group of groomsmen at an upcoming wedding. The beautiful and classic looking flask can hold up to six ounces of liquor, enough to help you get through that stressful day. This flask features a beautiful satin finish. Thanks to the funnel it's even easier to fill! Free Engraving is currently being offered on this flask in this gift set which makes this item a great value for your money. Bulk discount is available so make sure to take advantage of that deal and order today! The engraving on this flask will be done with a diamond rotary tip - which means you engraving will be forever etched into this flask. Don't purchase so called 'laser engraved' flasks when the diamond etching not only looks better, but lasts longer as well. �Weight of Flask: 3.60 oz. 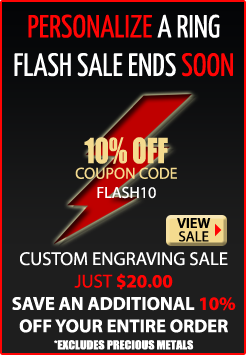 Looking for a more custom engraving? Give us a call or send us an email and we'll help you get what you need! ***Please note, there can be no exchanges or returns on custom engraved gifts, however if there is a quality problem with the flask or any problems with the engraving we will replace it within 30 days of the order.